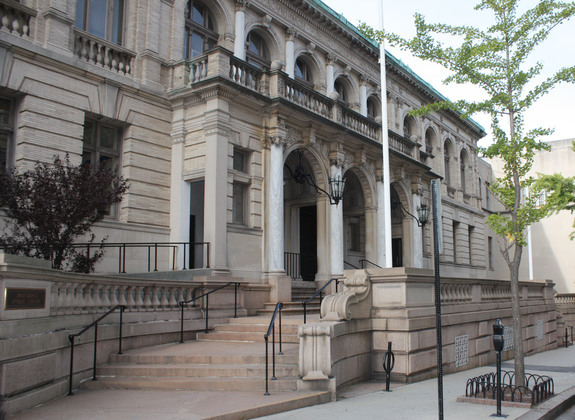 Providence Public Library is a 143-year-old nonprofit corporation providing free public library services through print, recorded and digital collections, information resources, programs of interest and relevance, and expert staff. The Library's 1900 building at 225 Washington Street, Providence, is on the registry of historic sites. Visitors may visit and take free guided architectural tours of the historic building on the first and third Tuesdays of each month (10:30 am) from April - December. Visit www.provlib.org for more information. Take 95 North to the Broadway exit (Exit 21) and merge right as you come off the exit ramp. Stay in the right lane and continue straight through the light. You will see the Providence Hilton and the Civic Center on your left. Stay in the right lane as the road curves to the right. The Library is on your right. Take 95 South to the Atwells Avenue exit (Exit 21). Turn left off the exit at the light, and cross back over 95 and continue straight through one set of lights. The Providence Hilton is on your left. Take slight left at next set of lights, curving around to the right and then continuing straight on Empire Street to the next set of traffic lights. The Library is immediately on the right (150 Empire Street). If you have crossed the Washington Street intersection, you’ve passed us. Take 195 West to 95 North to Exit 21 and continue with the directions "From the South."